Back Row, left to right: Bri Keran, myself, Bob Spears, Nitasha Sanders. / Front Row: Nicole Rotheleutner, Jesse Brutscher. Christopher Wren will always remain one of my most beloved roles. He was a character with an undeniable identity, one that was fun and boisterous, flamboyant and distinct. He felt like an actual person, moreso than the other characters I had played up until this point. Or perhaps I had now reached an affinity with the craft where it was easier for me to pick out the nuances of a character. Or perhaps it was because Wren was penned by the talented Agatha Christie. Whatever the case, taking on the role of Christopher Wren felt like I really knew what to look for - the things he noticed upon entering a room, how he responded to other people, the way he chose to present himself. And director Erik Steen really gave me the opportunity to explore that character and play around with his mannerisms and his nuances. It seemed I was toying with minor character moments much earlier in the rehearsal process than I had with any of my other shows up to that point. But what made Christopher Wren go from a fun on-stage performance to one of my most cherished roles was the fact that he had a very telling moment of vulnerability late in the show. He confides in another character, and he goes from the high-strung, exuberant fancy-man to an actual person, like someone I could've come to know at some point. I felt like I knew this character so well that by the time we did our production photo (above), it only felt natural to pose in that photo in a way that Wren would. It likely absolved my character of any suspicion in this murder mystery, but I was willing to sacrifice that part of the drama in order to make an impression on the audience as soon as possible. And not only did I get a wonderful character in the form of Christopher Wren, but the entire cast was full of characters that were vibrant and had a surprising amount of depth for an ensemble cast in a two-act play. Agatha Christie has since become a role model for me when it comes to story telling. I've tried to learn from her how best to inject character and realism into a large cast of characters in a limited amount of time. Front to back, left to right: Nitasha Sanders, myself, Nick Brutscher, Bri Keran, Nicole Rotheleutner, Michael Sanders, Bob Spears, Jesse Brutscher. Live performances were pretty standard for The Mousetrap. We did two weekends, with a matinee show during the second weekend (and perhaps the first weekend as well... memory is a bit fuzzy on that one). This was also the first show in which I broke the set during a performance - I slammed a door a bit too hard during one of my entrances, causing part of the trim to dislodge and fall to the floor. After a brief moment of shock, I then opened the door again, kicked the trim through to backstage, and closed the door once more. I was hoping that I could turn a mild catastrophe into a comedic moment while not drawing too much attention to it all, but ultimately the show continued without a hitch. This marked my first performance with the Brutscher brothers, as well as with Michael Sanders, a fellow actor who was also directing a show in Pequot Lakes while The Mousetrap was playing. All three of them were great fun to act alongside onstage, though Jesse has been the only one to continue acting in shows with me after this wrapped up. The Mousetrap is one of my favorite shows I've ever been in, both because it gave me a fun role and because it seemed to resonate with audiences in a way my other shows hadn't. 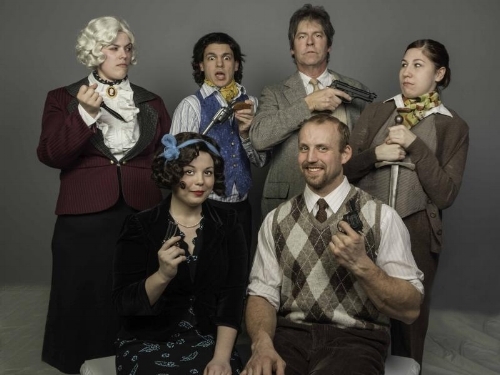 After all, this was an Agatha Christie story, so the theater goers of the Brainerd Lakes Area came into the show knowing what kind of show to expect, and that always helps get butts into seats. My next show, however, would present many unique challenges that nobody could've foreseen, but it also is number among the most fun I have ever had on stage. I, of course, am talking about my first titular role in the show The Servant of Two Masters, which I will cover in Theater Thursday next week!